With the Superbowl less than a week away and the season finally done, one would think that three weeks is ample time to recover from the anguish of a beloved team choking in the playoffs. Nate Kaeding, with a record and accuracy unsurpassed by anyone, is a phenomenal player and I think people forgot that, once he flubbed those field goals. That's the thing, people never remember what you did well but they never forget what you did wrong. He was actually anticipating being able to play in the Pro-Bowl, take it seriously and "Even though just an exhibition, it was going to afford him the opportunity to kick in a game." 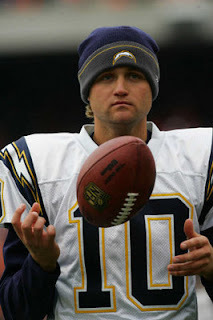 As a die-hard fan, I've gone back and forth surfing the net looking for statements and dying just to hear a bit of anything, something from Kaeding stating his thoughts and position on things. It was one of those times I wished he was on Twitter so that I could relentlessly message him why why why!!?? But I'm glad he isn't, because after reading some of the awful things people had to say, I think it was a better process for him to not see the hate. I knew there were two ways it could have been relayed, either he was in just as much of a shock and despair like the fans, or it was rigged and he was just gonna live with it. Although nothing can be said to change circumstances, I felt like a kid wanting to hear their childhood hero say anything to make him that great guy in the books again. This interview did just that! One of the things he's living with is that people won't remember what he's accomplished in the regular season but mainly remember the mistakes during post. My stance is this, even before this interview, I had decided that I was a Kaeding/Charger supporter before and will continue to. Despite how bad that game was, I've written and will stand firm on the point that it was a multitude of things that caused us to lose that game. Penalties, turnovers etc. 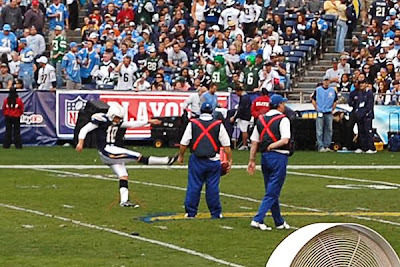 As it stands, Nate Kaeding is still the greatest kicker, and being a fan is supporting your players and teams during times of good and bad. I've always said that I have the biggest awe for Detroit Lions fans, to stay supportive even during a 0-16 season. Hell I still loved the Dolphins even after 1-15. My main sadness is that after this Sunday, season will be over and my Sundays for the next 7 months will be unknown.